Zettaset XCrypt Archive for PCF protects your backup artifacts with strong encryption. Integrated with CF BOSH Backup and Restore, it transparently and automatically encrypts and restores backup artifacts. Zettaset’s software-defined encryption platform is a software-only design, which provides high level security and enables it to easily scale out as needed. 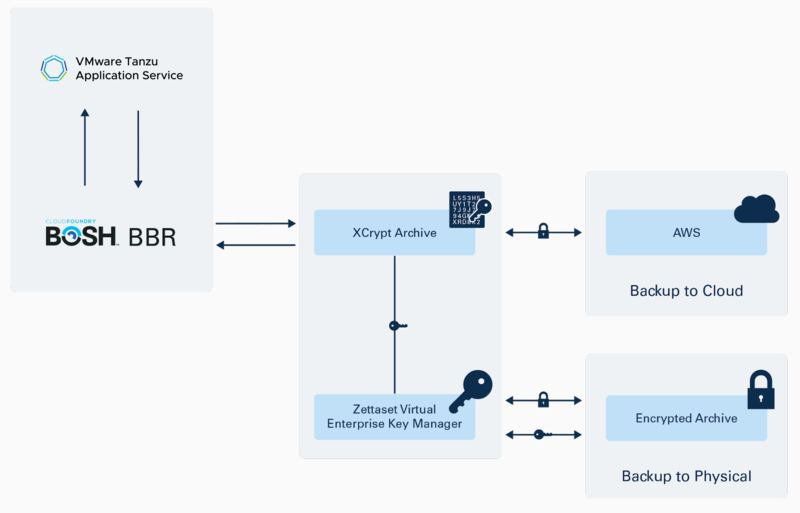 XCrypt Archive enables DevOps users to transparently and automatically encrypt and restore backup artifacts. Encrypts and decrypts artifacts as they stream to or from the backup store, either on the jumpbox or Concourse task, ensuring end-to-end security. XCrypt Archive is a software-based encryption tool that scales up or down effortlessly with your backup artifacts. XCrypt Archive is deployed on any VMs or jumpbox. XCrypt Virtual Enterprise Key Manager is deployed on any network node. Modifications are made to call XCrypt Archive CLI from BOSH Backup and Restore (BBR). Customer uses BBR according to their existing workflow.